Hiya guys! Now I know my nail length has kind of been all over the place these last few posts. In some posts you can notice a bit of free edge while in others I'm parked in nub city. Pretty much I am just getting around to posting some manis and swatches that I did during my last filing incident. In all honesty, I am still struggling with finding that 'right' length before they start to curl too much. Here's hoping tonights filing session doesn't leave me nubbing it again. That aside, today I'll be sharing some new sticker decals that I received from Born Pretty Store. These are super unique and unlike any of the prior decals I have tried. Let's take a look! These can be purchased through Born Pretty Store listed as item #20557 pattern #0J-3D-752. Each sheet has over a dozen individual decals and retails for $1.96 per sheet. I'll fully admit that sometimes I don't read instructions before I leap into something... Case and point, when I found myself dipping these in water and not having success. So much fail on my part especially because I was attempting to record the process, haha. After I realized the error of my ways and simply peeled the sticker I was left in awe. So freaking easy! The adhesive is sticky enough to not lift even if you have to reposition the decal a few times. These definitely have my seal of approve. 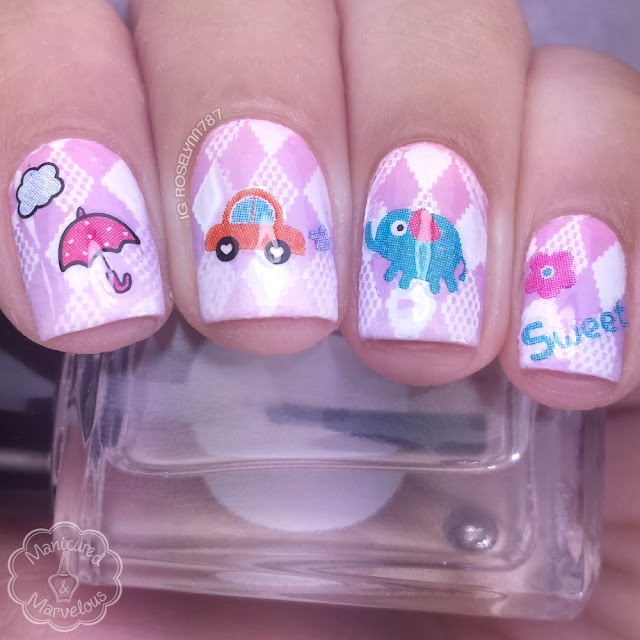 For the background, I really wanted to go for something girly and child-like so that it matched the decals. First I created a gradient using Sinful Colors Whiteboard, Pink Break, and Truth or Lavendare (these will be reviewed tomorrow). The pattern is from the MoYou stamping plate Fashionista #14. After that I applied a matte topcoat and then proceeded to place the decals. As I mentioned before, these decals do not need any water. Kind of makes things a little easier and faster, in my opinion. But you definitely want to wait until your base is fully dry in case you need to reposition the decal. Super cute! I like that these can be used without water, it's a really nice manicure! Thank you! I definitely love that we don't need water for it. Thanks a lot. I'm glad you love it. I definitely didn't want to take it off. The elephants are just too cute!! These were part of a handful I wanted to purchase from the site! Haha, it was way simpler than you suspected at first! Lovely results with these! Right?! I wish I would of realized it sooner though haha I ruined a few trying to get them to work in water haha. Such a super cute mani!! Ahh! These are extremely adorable!! Thank you, I really loved how cutesy it ended up turning out. 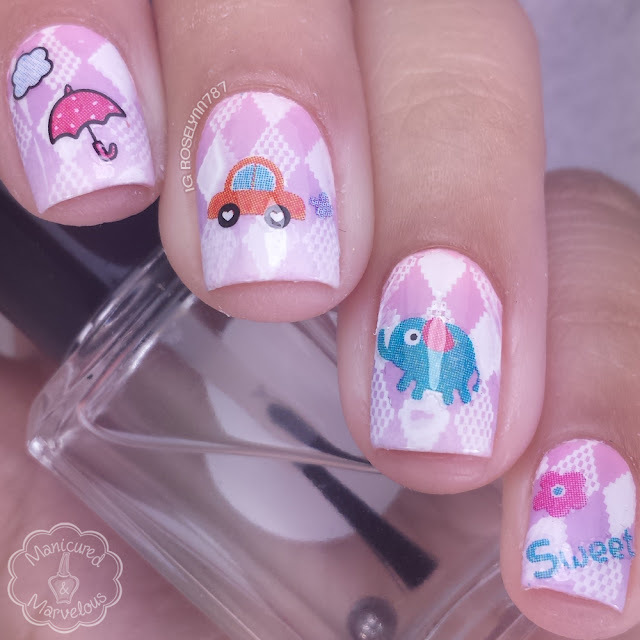 This is such an adorable mani! Thank you very much for your review. I have heard people having trouble ordering clothing from this store, but good to know accessories work. No problem I'm glad you found it helpful. I've never ordered clothes from there before, because I assume as a plus size girl I would not find anything my size. Clothing from overseas tend to run so small as it is. 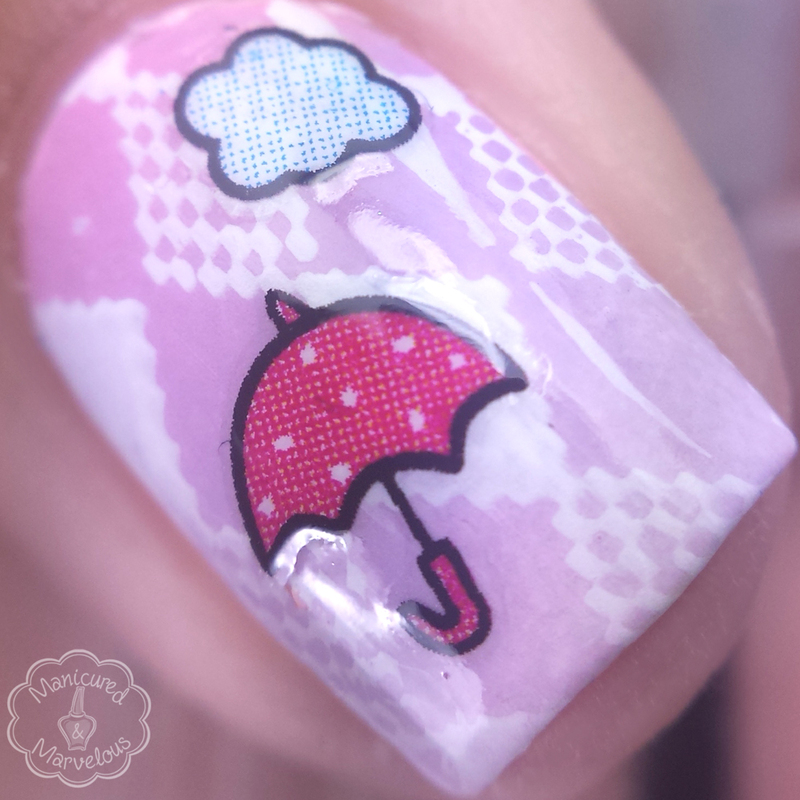 I'm not a fan of water decals, but with the pattern you did underneath this looks like an adorable baby blanket! Really cute! These are sticker decals not water ones, which makes it so much easier to use. It also just looks so much better than water decals usually do because it doesn't have that hint of transparency. These are so freaking cute, I can't even stand it. Love the background pattern too! "Super Cute" is an understatement!